Aerospace giant Airbus is to sponsor the Bristol stage of this year’s OVO Energy Tour of Britain – the UK’s most prestigious road cycling event. 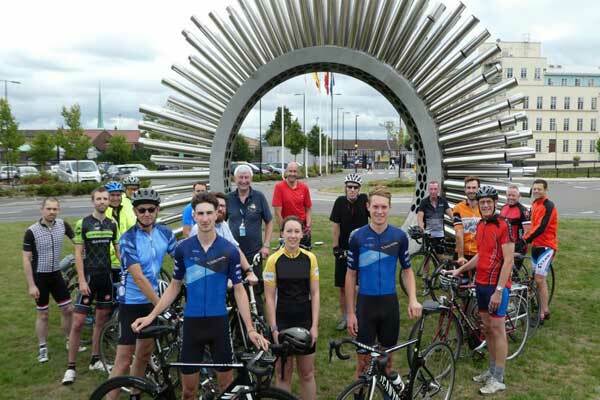 Canyon Eisberg duo Rory Townsend and Louis Rose-Davies today joined members of the company’s Bicycle User Group (BUG) at its Filton production site, which is just a few miles from where Stage Three will start and finish on Tuesday 4 September. Mark Stewart, Airbus General Manager and HR Director, added: “Typically, we have 400 to 500 employees cycling to work in Filton each day and about 10 per cent of the workforce travels to work by bicycle every day. As well as organising various cycling events and initiatives, the Airbus BUG also provides staff with free safety accessories, such as hi-viz rucksack covers and waistcoats, free lights and puncture repair kits. A mobile bicycle mechanic visits the site each month to carry out repairs and servicing, while specialist tools are available for staff to borrow to carry out their own repairs at home. 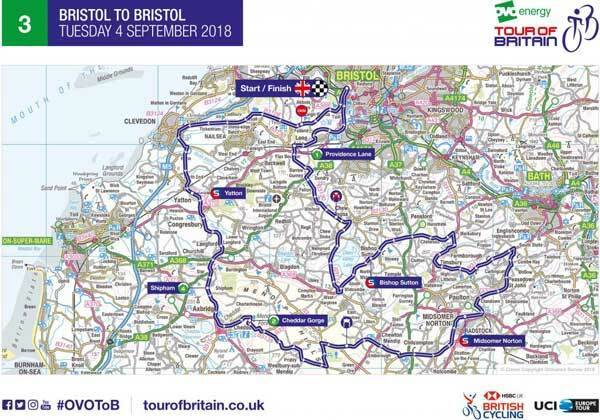 Stage Three of the OVO Energy Tour of Britain will cover 128 kilometres in a short and sharp stage that both starts and finishes at Ladies Mile on Clifton Down in Bristol. The route will take in both natural and man-made wonders, climbing Cheddar Gorge in the Mendip Hills while also crossing the world-famous Clifton Suspension Bridge twice. It will be the third time that the free-to-attend OVO Energy Tour of Britain has visited Bristol since 2014. Commenting on the news, Heath Harvey, Chief Executive of race organiser SweetSpot, said: “We are delighted that Airbus have chosen to support the Bristol stage of the OVO Energy Tour of Britain. Not only are Airbus a world-leading brand, but also one that passionately supports and encourages their workforce in Bristol to cycle to work. The Bristol stage of the race will get underway at 11:30am on Tuesday 4 September, and include the likes of Clevedon, Cheddar and Midsomer Norton on the route, with an expected finish on Ladies Mile at around 14:30pm. 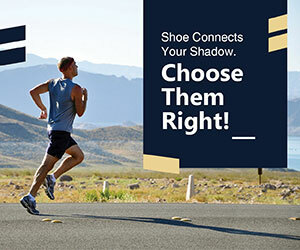 The full route and timings can be found here. Live coverage of the entire stage will be shown on ITV4, with fans in Bristol having the opportunity to follow the action throughout via a big screen in the Tour Village, as well as having the opportunity to meet and engage with official sponsors, including Airbus, who will be present on the day.